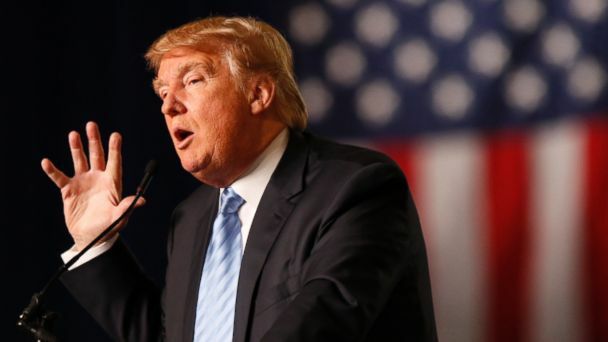 Republican presidential front-runner Donald Trump double-downed today on his proposal to temporarily bar all Muslims from entering the United States. "Something has to be done," Trump told ABC News' George Stephanopoulos during an interview on "Good Morning America" "What I'm doing is calling very simply for Muslims entering the United States until our country's representatives can figure out what is going on." Trump's plan would block all Muslims from entering the United States, with an exception for U.S. citizens who are Muslim, who would come and go as they wish. He hopes the ban "will go quickly," as soon as "our leaders figure out what the hell is going on," Trump said. "If a person is a Muslim, goes overseas and comes back, they can come back. They're a citizen. That's different," Trump said. "But we have to figure things out." He said his plan has been met with praise despite his opponents' coming out overnight slamming it. The plan has been compared to Japanese internment camps used by President Franklin Roosevelt during World War II, but Trump says he has no interest in internment camps. "This is a president highly respected by all, he did the same thing," Trump said. "If you look at what he was doing, it was far worse. I mean, he was talking about the Germans because we're at war. "We are now at war," Trump added. "We have a president that doesn't want to say that, but we are now at war." The New York real estate mogul had already defended his plan Monday night, reading a statement at a rally aboard the USS Yorktown in Mount Pleasant, South Carolina, that said, "Without looking at the various polling data, it is obvious to anybody the hatred is beyond comprehension. Where this hatred comes from and why we will have to determine. Until we are able to determine and understand this problem and the dangerous threat it poses, our country cannot be the victims of horrendous attacks by people that believe only in Jihad, and have no sense of reason or respect for human life." When asked earlier Monday which Muslims would be banned from entering, Trump's campaign manager Corey Lewandowki told ABC News "the ban applies to everyone." On Friday, Trump's rally at Dorton Arena in Raleigh was peppered with disruptions from protesters as Trump addressed a number of issues. "We're going to make our country greater than ever before," he said. "We need tremendous smarts. We need somebody's who's going to get the job done." Trump focused much of his speech on Syrian refugees and immigration. He said undocumented workers are often treated better than veterans in this country. He also explained his plans to remove Syrian refugees and undocumented workers if elected. "If I win, they gotta go back. They have got to go back," he said. "He has insulted Muslim communities members, immigrant community members, women. He has this long track record of attacking pretty much everyone," said protestor Zainadine Alsous on Friday. Meanwhile, Trump leads the national GOP race and continues to poll well in North Carolina.